Hallmark has unveiled their collection of new 2019 Halloween-themed Keepsake ornaments, including a trio of classic monsters rocking out, more residents of Halloween Town, and Charlie Brown in his trick or treating costume. All of the new Halloween Keepsake ornaments from Hallmark will be released on July 13, 2019. The Monster Mash Collection features “Wolfgang” on drums, Dracula on organ, and “Frank” on bass, as each ornament lights up and plays classic song “Monster Mash”. They each retail for $24.99. From The Peanuts franchise, “The Halloween Vulture” features a costumed Charlie Brown, in for a surprise when he shines his flashlight into a tree where Snoopy is lurking—and looking like a vulture—over the trick-or-treaters. Press the button on this playful Halloween ornament to see the flashlight illuminate and hear Snoopy’s mischievous cackle as he startles his owner. This is also priced at $24.99. The 7th annual ornament in the “Happy Halloween!” collector’s series will tickle your funny bone, with its diorama-style jack-o’-lantern, inside of which is a skeleton boy meandering through a cemetery with his skeleton dog. Priced at $15.99. The “Bewitching Black Cat” is embellished with ornate designs in sparkling purple and orange, with a crescent moon charm dangling from her feet, priced at $15.99. The “Stately Little Raven” is a hauntingly lovely miniature ornament with a shimmering deep blue body and rich purple feathers embellished with glitter, as the elegant bird carries a gold crescent moon. It is priced at $7.99. The “Tiny Black Cat” is another miniature Halloween ornament featuring a black cat perched in a grinning jack-o’-lantern, dressed in a purple and orange party hat with a big purple bow, retailing for $7.99. The “Spooky Sugar Skull” ornament celebrates the traditions of Día de los Muertos with a rainbow of classic floral designs with glitter accents adorning a vibrant blue calavera. It is prices at $15.99. From Tim Burton’s The Nightmare Before Christmas, you can scare up some holiday fun with the Scary Teddy and Undead Duck set of two ornaments for $19.99. 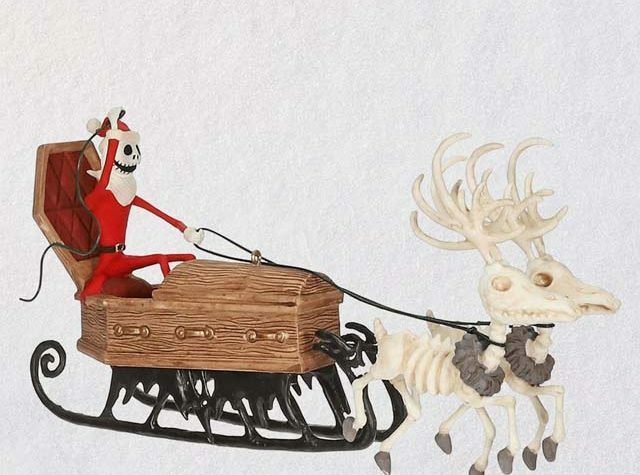 There is also Jack Skellington decked out in his “Sandy Claws” suit for $18.99, and the Pumpkin King at the reins of his coffin sleigh being pulled by a team of skeleton reindeer, available for $32.99. All of the above ornaments are available from Hallmark.